PRC nurses Michelle Popler and Emily Morrison and nurse manager, Nancy Ferzola, with a diabetes study participant. ACTSI Pediatrics, in collaboration with the Clinical Research Network, and Children's Healthcare of Atlanta supports a Clinical Research Site located on the Egleston campus. 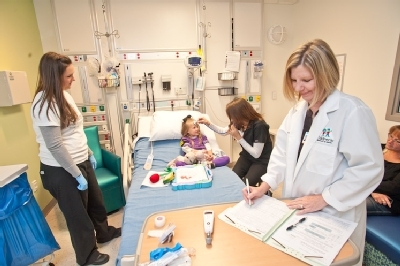 The Pediatric Research Center (PRC) is designed to provide the necessary infrastructure for investigators conducting pediatric clinical research.